An autonomous robot arm which plays board games (checkers, chess). Developed libraries allowing connection to the Wii Nunchuck and implementation of inverse kinematic position calculation. Hardware and FPGA fanatic. Drexel Student. After more testing and prototyping, the implementation of programmatic limits to the arm's motion is a much more involved task than we'd anticipated. This will be completed at a later date, with more sleep. More work was done to refine the IK algorithms, and the motion of the arm is now much more accurate at extreme angles. 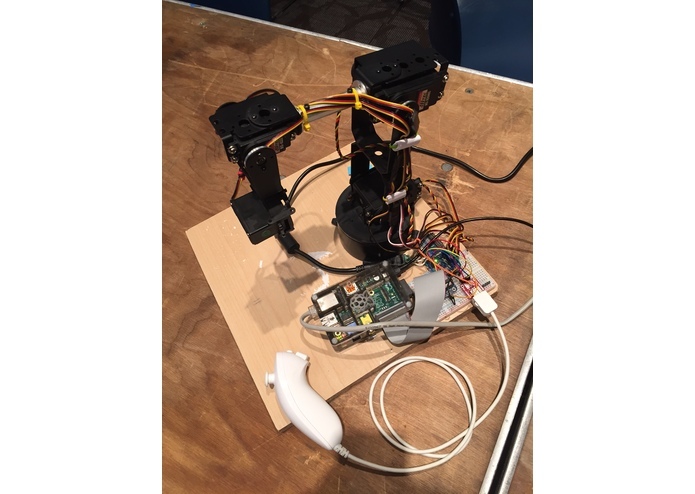 The robot arm now has the ability to calculate its position by inverse kinematics. It can be controlled manually with a Wii Nunchuck. Still to be done this weekend: establishing programmatic limits to the arm's motion to prevent manual control from damaging the arm.